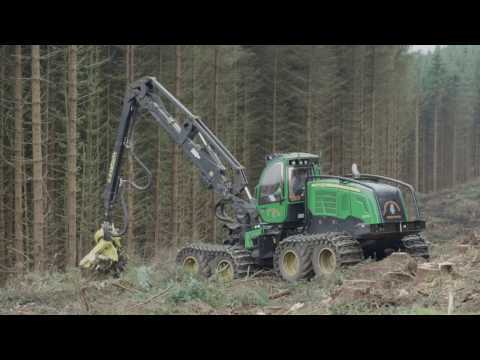 BSW Timber Group is the largest integrated forestry business in the UK. It is a family-owned business that has four main operating divisions: forestry, sawmilling, timber manufacturing and energy. The group has seven sawmills in the UK – in Newbridge-on-Wye, Southampton, Carlisle, Dalbeattie, Petersmuir, Fort William and Boat of Garten – and one in Riga, Latvia. The headquarters remain in Earlston, Berwickshire, where the business originated. BSW manufactures and supplies a wide range of quality, FSC®-certified sawn products for an array of industries, including fencing, landscaping, cladding, construction, DIY, decking, and packaging. This covers everything from C16 construction timber to innovative products such as composite decking and acoustic fence panels. The company also offers fencing components – such as posts, rails, and boards – in addition to sleepers, purlins, beams, baulks and large sections (up to 8m long). Co-products such as sawdust, shavings, chips and bark are also supplied into pulp and paper, chipboard, horticultural and energy generation sectors, while BSW Energy makes use of these sawmill residues – the rest of the log – to manufacture environmentally-friendly wood fuel products. Having undertaken a £125m investment programme over the last 10 years, BSW is committed to supporting sustainable forestry. All the company’s timber is FSC certified – and Chain of Custody certification traces the wood from forest to distribution. This ensures that customers receive timber that is from legal, environmentally appropriate, socially beneficial and economically viable forests. BSW has 1,300 employees and is passionate about creating a sustainable future for British forests and woodlands, and as such the company is a proud member of Grown in Britain. For every tree BSW harvests, a minimum of three are planted in its place, and the group uses 100% of the log it receives.